It has been 3 years since Cambridge Court World School have been established in the list of ‘Top Schools in Jaipur’. 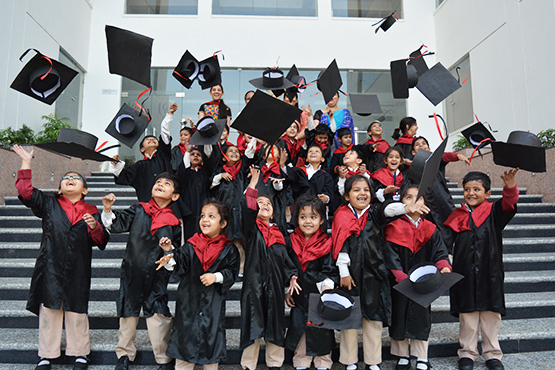 Cambridge Court World School in its endeavour to cater to the global need of today’s youth, aims to promote and sustain high academic principles along with retaining the strong value system and ethics with an emphasis laid on global standards of education. The school aims to nurture and groom the future leaders as good human beings, upright citizens with strong morale, self reliance and versatility. One of the Top Schools in Jaipur, at Cambridge Court World School a new milestone is being set on the basis of education, sports and co-curricular activities. We strongly believe in the maxim that curiosity is the basis of education, thus we lead the students towards the path of discovery. Learners are engaged and encouraged towards self-empowerment. For this ‘self-learning’ environment is created where they are engaged in the innovative activities to enhance their personality. They are encouraged to look beyond text books and to foster different skills such as investigation, analytical approach, observation etc. Transfer of knowledge is carried out with the help of latest technology i.e. Smart Classes. These smart classes facilitate synergy of ideas among learners. It is difficult to maintain the position of Top School of Jaipur, therefore we believe in expansion of technology and expanded knowledge of the learning process that have already resulted in a metamorphosis of teaching methods. We prepare the learners through a unique and well-defined curriculum. The school is a complete network of information and technology. The school is constantly enhancing and developing strategies that will increase the integration of information, communication and technology into learning. Hence we can say that Cambridge Court World School is the top School Jaipur. Value Based Knowledge is imparted in an interactive manner where students can share their ideas, opinions and thoughts freely to meet the challenges of 21st century. We have always emphasised on Emotional Quotient of the learners and this makes us a step ahead of the top School Jaipur. Emotional Quotient involves the ability to carry out accurate reasoning and the ability to use emotions and emotional knowledge to enhance skills and learning process. We transform the dreams into reality by promoting STEM Classes which provide them with information on future topics such as ‘Robotics’ Models of simple machines and dealing with engineering kit. It is our firm belief that every learner should be fit and healthy. Cambridge Court World School is the Top School in Jaipur to continue this philosophy we provide our students with 18 hobbies which again makes us Jaipur Top School. We provide best infrastructure with impeccable coaches. Our vision is to nurture the future citizens of tomorrow and to provide an environment of multifaceted growth of the students based on interdependence and respect for all life.